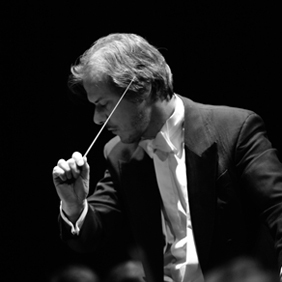 After studying the piano in Fribourg and conducting in Basel, Laurent Gendre was awarded the first prize for conducting by the Association des Musiciens Suisses before completing his studies in Germany and Austria. Notable among the orchestras he has conducted are the Symphonic Orchestra of Berne, the Orchestre de Bretagne, the National Orchestra of Latvia, the Lausanne Chamber Orchestra, the Camerata Zürich and La Cetra Basel baroque orchestra. Since 1999, he has been the musical director of the Orchestra of Thoune, performing ten concerts every season. He founded the Orchestre de Chambre Fribourgeois, which began performing early in 2009. As operatic director, he conducts many performances in both Switzerland and France, notably the operas of Lausanne, Rennes, Reims, Dijon and Besançon. He is musical director of the Opera of Fribourg. Gendre has been invited to perform with the Orlando Fribourg Ensemble at festivals in many countries in Europe. The Ensemble has made several recordings that have been hailed by the specialised press (Répertoire, Pizzicato’s CD of the Month, 5 de Diapason). Their forthcoming CD, edited by Cantus Records, will be devoted to the “Psalms of David” by H. Schütz. As conductor of the Oratorio Choir and Symphonic Orchestra of Berne, he interprets works from the oratorio repertoire, including Le Martyr de Saint-Sébastien, Elijah, Elgar’s Dream of Gerontius, Janacek’s “Glagolitic Mass”, “A German Requiem” by Brahms, the “Mass in F Minor” by Bruckner, the “Requiem” by Dvorak and Szenen aux Goethes Faust by Schumann. During the 2013-14 season, Laurent Gendre will be conducting Dvorak’s Stabat Mater at the Kultur-Casino in Berne, Viva la Mamma by Donizetti at the Opéra de Metz, and Offenbach’s Voyage dans la lune in Fribourg and Lausanne.